This beautiful apartment is situated at the quiet end of the most central street on the Ile St Louis, which runs across the island from east to west. The Ile St Louis exudes beauty and charm with its elegant 17th century architecture, boutiques, narrow streets and magnificent views from its tree-lined quays. There is a real village feel here, despite its central Paris location, with a mixture of bistros and brasseries, chocolate and food shops, a florist, boulangeries, a wonderful cheese shop and many cafés. 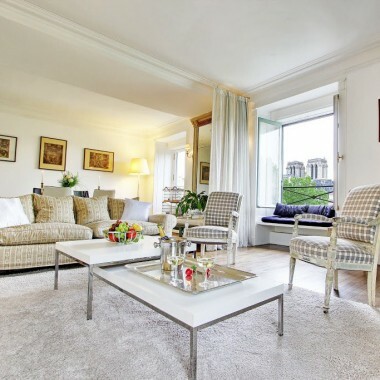 The very tastefully furnished three bedroom, two bathroom apartment (110m2) is on the second floor of a 17th century building and was the home of a great French composer, Henri Dutilleux. 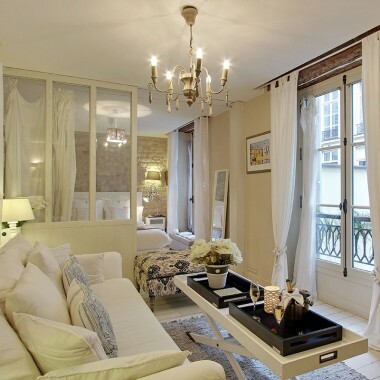 Features include parquet floors, high ceilings, elegant furnishing, a marble fireplace and seven large windows. The colours are soothing gray, cream and beige. 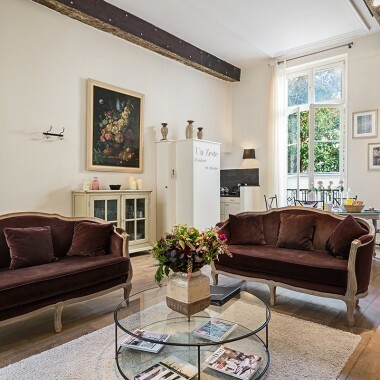 The apartment has been recently totally renovated in a simple, elegant style that highlights the 17th century designs on the woodwork and the Versailles parquet floor style. The windows overlook a peaceful leafy courtyard and the charming rooftops across the street. The entry to the apartment is into the large living room, and dining area, with dining table for six people. The fully equipped open-plan kitchen is also in the living/dining room space. Living room with dining area and open-plan kitchen (induction hob, microwave, oven and fridge, freezer, dishwasher, coffee maker, toaster and electrical kettle. Master bedroom with queen-size bed. En-suite bathroom with bathtub, wash basin and also the washing machine/dryer. Twin bedroom (can be made up as king-size bed on request). Single bedroom. Bathroom with shower and wash basin. Separate WC. This beautiful rental apartment is situated at the quiet end of the most central street on the Ile St Louis, which runs across the island from east to west. The Ile St Louis exudes beauty and charm with its elegant 17th century architecture, modern boutiques, narrow streets and magnificent views from its tree-lined quays. TThe many famous sights nearby include the Louvre Museum, the Centre Pompidou, the left Bank, Latin Quarter and Sainte Chapelle. 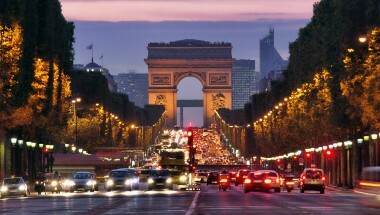 Visiting Paris in June? 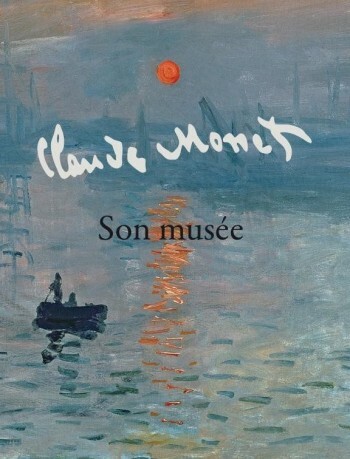 Don’t miss these great exhibitions!